Who didn't completely geek out when these words were uttered in The Avengers movie trailer? Not many people I imagine. Hence we lead into my review of the 6868 Hulk's Helicarrier Breakout set. First impressions were "I need that Hulk maxifigure". I didn't much attention to anything else in the set to begin with, solely focusing on the big, green guy. Checking out the scale compared to the other minifigures and he was very impressive. Then we cast our eye over the rest of the set. 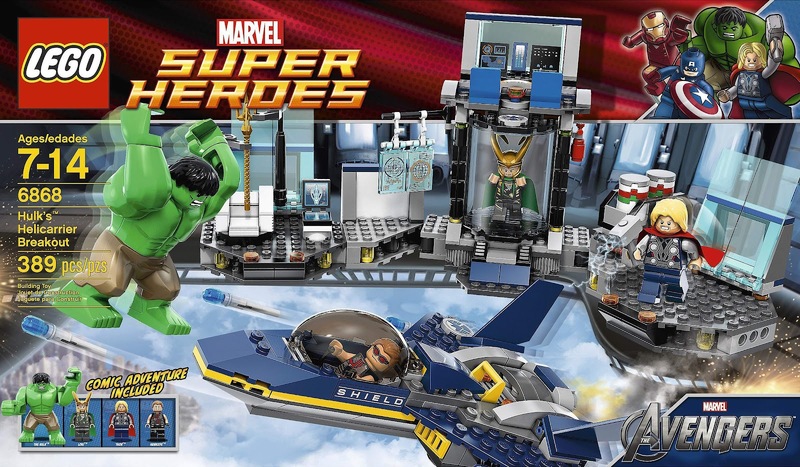 The jet looks small but neat with Hawkeye flying it, Thor soaring through the scene with Loki trapped in his cell. The rest of the set is a bit of a mixture of scenes on the helicarrier all rolled into one. Interestingly, the set name really does detail what happens in the scene, yet the description is more about the Avengers stopping Loki. Lego was obviously busy trying not to spoil the movie! Did I mention we have a Hulk? First of all, let's have a look at the minifigures.... umm and a maxi figure. There might be one tiny reason to purchase this set.... well until he gets angry! 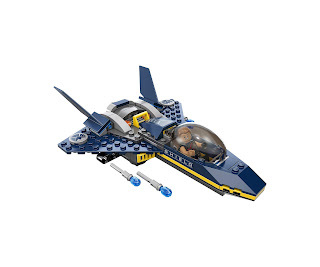 This Thor minifigure is also available in the 6869 Quinjet Aerial Battle as well as the 30163 Thor and the Cosmic Cube polybag. This Hawkeye minifigure is also available in the 6867 Loki's Cosmic Cube Escape set as well as the 30165 Hawkeye with Equipment polybag. This Loki minifigure is also available in the 6867 Loki's Cosmic Cube Escape and 6869 Quinjet Aerial Battle sets. Oh, did I mention this set has a Hulk? A small but decent looking fighter which contains..... flick fire missiles! Oh how we love this feature! That being said, the kids love it. There will be lots of "swooshing" with the jet as it attacks the Hulk and Loki. Apart from the movie features, the cell is also able to explode open freeing Loki. The fuel canisters next to the cell can also "explode" and fly everywhere. The builds are very simple and shouldn't pose many issues, though adults may need to help younger builders. Going by the sold listings, the three minifigures total $34.32, with the current asking prices totalling $46.45. When we consider full retail price for this set is $49.99, there is a decent gap between this and the sold minifigure prices. What is clearly seen is that the value in this set lies with the Hulk. As we can see, the Mines of Moria set is a bit different to the norm, as it has a much higher piece count (with a lot of tiles) and more minifigures which helps bring down the price per piece. Compared to the other Maxifig sets, this set actually is very reasonably priced. Between DC and Marvel, Lego has thus far issued 29 sets under the Super Heroes line, polybags excluded. Of this, 15 sets are based on DC characters leaving 14 from the Marvel Universe. Breaking down the Marvel Universe sets further there are 3 maxi builds, 3 Iron Man sets, 3 Spider-Man sets, 1 X-Men set and finally 4 Avengers sets. The Avengers is the third highest grossing cinematic event of all time, making over $1.5 billion at the box office. Iron Man 3 followed it up as the fifth highest grossing film of all time, returning over $1.2 billion. Over the course of the 7 films in this series thus far (Iron Man 1, 2 and 3, Incredible Hulk, Captain America, Thor and The Avengers) the films have grossed over $5 billion. To say it is popular would be an understatement. And.... this set has a Hulk! This set was released in April 2012 and is still currently available. It was available in many stores and easily accessible to consumers, though with only four minifigures and a higher price per piece ratio it may possibly have dissuaded potential buyers. Still, being a mid-range set it would remain appealing because A LOT of children (and adults!) want to have a Hulk in their collection. The box art is fairly neat with the vehicles prominently displayed as the minifigures interact with them. The back is well laid out, similar to a comic, whilst detailing the features both vehicles have. The box itself seems very sturdy with the thicker cardboard used on some sets. The issue, as always, is you can feel the hollow sections when squeezing the boxes due to the large amount of space inside. I must say, the cover portrays the events in the Avengers better than Lego's description. Whilst there are some inaccuracies, the main idea of Hulk going nuts on everyone is there. Well according to Brick Picker this set is already doing well, returning above RRP. I am not so certain that is correct so will not use this information for now. If we look back at our minifigure prices, they are already yielding a fantastic return, led by the Hulk. Is that a surprise? The CAGR of the Super Hero theme is 22.62%, above the 11.36% Lego average. As we can see with the Hoth Wampa Cave, maxifigure sets whilst being initially expensive and decrease can make up ground quickly once they go EOL. The Hulk set could already potentially be above it. Let us not forget, this is also based on full retail price. There are many clearances and discounts which savvy buyers are taking advantage of. 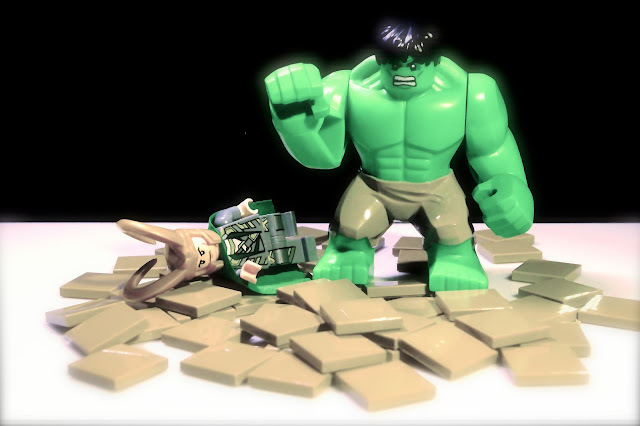 With no further Hulk movies planned and his next appearance being in the Avengers sequels, it could be awhile before we see Dr Banner's alter ego in another Lego set. The longer he is absent from the screen, the less likely he will appear in Lego sets making this the only set to buy him in for the near future. The playset itself is very average and doesn't display impressively. The SHIELD jet is neat enough as are the minifigures. The only thing in this set that will stand out though is the Hulk maxifigure. Standing above all minifigures and parts of set, his green, bulky stature is defined and commands attention. The 6868 Hulk's Helicarrier Breakout set is impressive for one reason alone..... the big guy. Expensively priced compared to other sets (however not maxifigure sets) this set currently is the only set where you can obtain this maxifigure. The other minifigures in this set are easily obtainable, as are versions of the other Avengers. There has been a plethora of Iron Man minifigure releases, Captain America is in a cheap set (and has an upcoming sequel), Thor is available in 2 sets and a polybag (and has an upcoming sequel), Hawkeye is available in 2 sets and a polybag, the Black Widow is only available in 1 set (it has a higher price but she is also in the Captain America sequel) and Loki is everywhere. This could be the only Hulk figure we see for the near future. The rest of the set is fairly insignificant and simply pads out the price. The designers tried to incorporate as much of the Helicarrier as they could into as few bricks as they needed, resulting in an ordinary design. That being said, kids and adults alike are just going to let Hulk smash the place anyway. Super Heroes sets sell well once they are discontinued as we have seen that across both DC and Marvel sets with a healthy CAGR well above standard Lego returns. There is no reason to think this set will do any different, especially with its focal point being an exceptional figure. With many discounts and clearances on offer, it would be prudent to secure a few of these as the Hulk figure will keep the price in this set from falling.